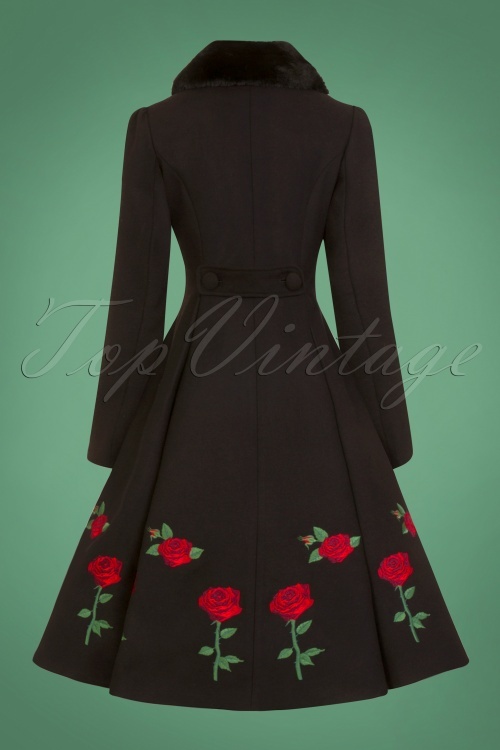 This fabulous 40s Rosa Rossa Coat in Black is guaranteed to keep you warm! Winter may not be your favourite season but with this Rosa Rossa Coat you'll want temperatures to drop ;-) This swing coat features beautiful detailing such as the soft, rounded and detachable black faux fur collar, long puff sleeves and a stylish fitted bodice. 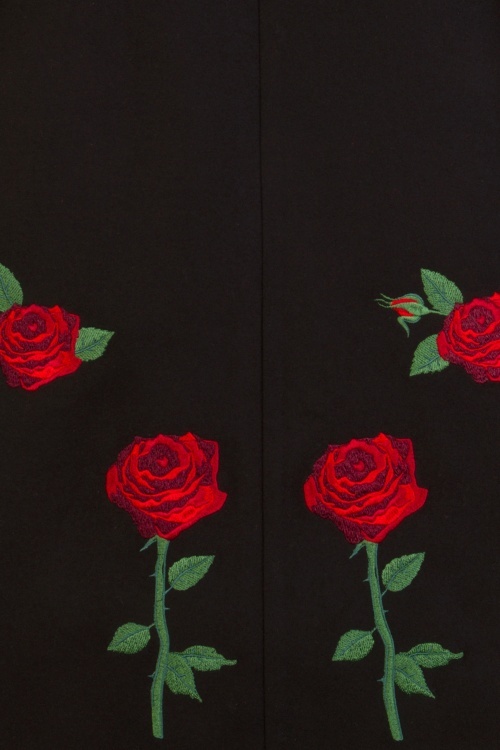 She runs from the waist down into a wide pleated skirt which creates a classic vintage silhouette and is embellished with embroidered red roses along the hem. Amazingly beautiful and practical; you can use the side pockets to keep your hands warm. Made of a thicker, heavy quality, sturdy, yet supple and soft fabric (doesn't stretch!) in classic black and fully lined. 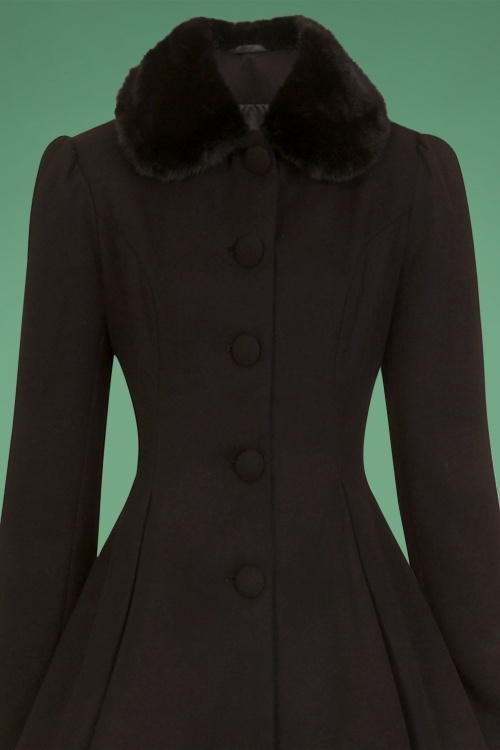 Winter is coming... so be sure to order this forties fab coat before winter arrives! Habits de très belle qualité. Le manteau est grandiose. La robe est très classe. Les chaussettes douillettes ! Quant au pull, il est très confortable. Une commande d'articles zéro défaut ! Dieser Mantel ist einfach umwerfend. Der Schnitt, die victorianischen Puffärmel und die Rosenbordüre machen den Mantel zu einem Traum. Das Fellimitat des Kragens ist schön weich und sieht edel aus. Bin 1,68 m, 62 kg. Um auch eine Strickjacke drunter zu tragen, habe ich Größe M gewählt und diese passt perfekt. Da Mäntel nicht mehr als Hängeware, sondern in einem Karton geliefert werden, musste ich das schöne Teil natürlich aufbügeln. Aber trotzdem hat sich die stolze Investition von 209,00 € gelohnt-der Mantel ist einmalig. when you wear this stunning coat you feel like a queen!! I never had more beautifull coat than this!! This is the most beautiful coat I have ever seen or owned. It fits very nicely, however I would NOT recommend going up a size if you are in between sizes; I was unsure of whether a size M och size L would be best, however I took a gamble and went for a size M. It fits me wonderfully, I was worried it would be too small in the waist and the bust but it is perfect in the bust and even leaves a little room in the waist, even with a thick cardigan underneath. The roses are beautiful and even more popping in colour than in the picture. The length hits me below the knees at my height of 164 cm (5'4) and it has got an amazing amount of fabric, giving it a wonderful silhouette. The coat feels heavy and of great quality, the faux fur collar is a cute touch. The pockets are not very deep but adequate. All in all, a wonderful coat that I can not wait to wear! Wat een geweldig mooie, dikke, warme jas met een absoluut mooie snit, glanzend rozenpatroon, juiste maatgeving, bij 1.70m. en een warme pully eronder een maat M die heel mooi staat. Wel heb ik ook de vouwen eruit moeten strijken, wat nog een heel karwei was gezien de lengte en omtrek om op de strijkplank te leggen, maar het is gelukt en hij hangt er prachtig bij.